I loved the Radicchio Salad with Green Olive Toast and a Manchego Vinaigrette at Toro Bravo - Portland - Oregon so much that I had to try re-creating it at home. But, at $14 for the ingredients, this was definitely one of the most expensive salads I've ever made so it's not something I'd make often. 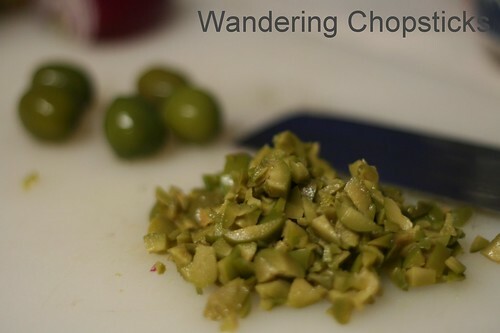 Although, the Manchego cheese and the jar of olives were used for several other recipes, and still have some left, so there is that in its favor. I found a small wedge of Manchego cheese at Fresh and Easy for about $4. If you can't find any where you are, I'd suggest substituting with fresh Parmesan cheese. 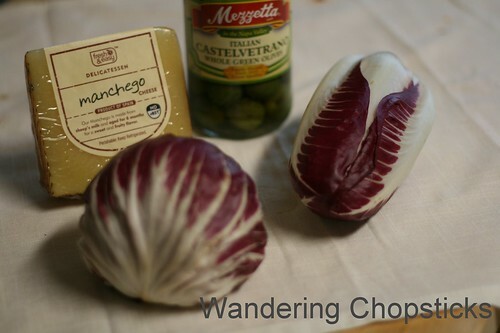 The Manchego tasted very mild, and I don't feel it was as crucial to the recipe as were the radicchio or olives. Instead of cocktail olives, I splurged on a $5 jar of Italian Castelvetrano whole green olives, which looked less salty and fresher, the type that seemed to be in Toro Bravo's version. 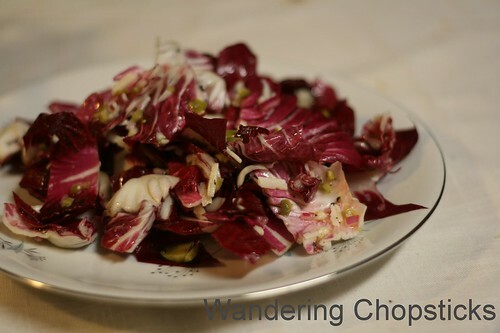 You can find radicchio for $2 a head sometimes at Fresh and Easy, otherwise, it was a whopping $8 a pound at the regular grocery store. 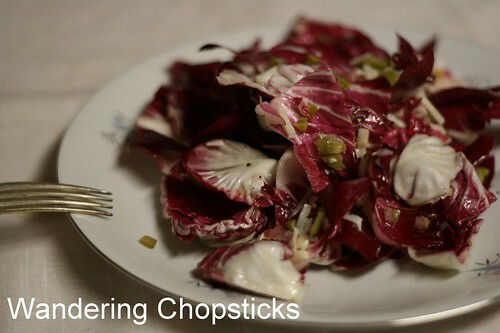 Radicchio leaves aren't as heavy or compact as cabbage so hopefully it won't cost you that much. 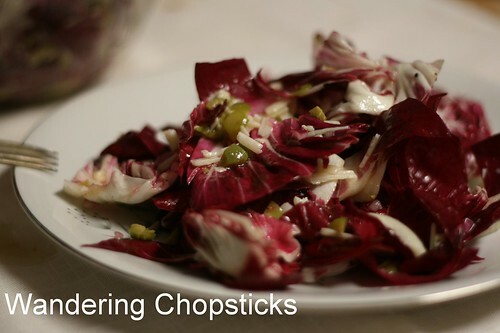 Once you've splurged on all those ingredients, and made a basic vinaigrette, the contrasts of the slightly bitter radicchio leaves with the saltiness of the olives makes this a simple, but flavorful salad. Inspired by the Radicchio Salad with Green Olive Toast and a Manchego Vinaigrette at Toro Bravo - Portland - Oregon. Optional: Substitute fresh Parmesan cheese for the Manchego if you can't find it. 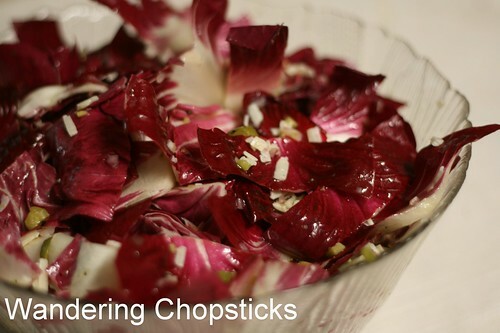 I found two kinds of radicchio at the grocery store so I used both, but the regular round head of radicchio works fine. Mince the green olives. The Castelvetrano olives aren't as salty as cocktail olives so I used about 8 olives, but suggest starting with about half a dozen. You can always add more later. 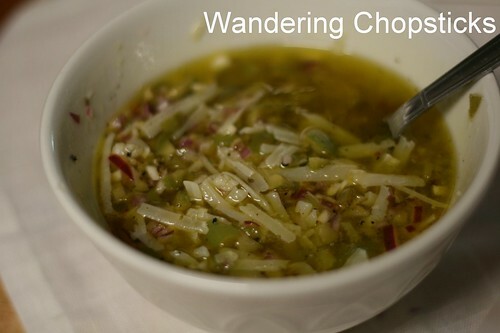 Then add 1 minced shallot, 2 cloves minced garlic, juice of 1lemon, 1/2 tsp sea salt, 1/2 tsp fresh ground black pepper, 2 tblsp white wine vinegar, 1/4 cup olive oil, and 1/4 cup grated Manchego cheese. Stir to combine. Taste and adjust if necessary. 1 year ago today, Tacos Mexico - (East) Los Angeles. 2 years ago today, Shin-Sen-Gumi Hakata Ramen - Gardena. 3 years ago today, How to Chop and Prepare Sugarcane. 4 years ago today, Egg Rolls with Salmon and Avocado.